(PHOENIX) – In the spirit of bipartisanship, the Arizona Republican Party announced today it will be purchasing an “I LOVE OBAMACARE” bumper sticker for Democrat Senate candidate Richard Carmona and encouraging Carmona to proudly display it on his car as he drives around Arizona in the months ahead. The Democratic Senatorial Campaign Committee in Washington, which is helping to run Carmona’s campaign from Washington, is selling the $3 bumper stickers online to their supporters so that they can advertise their support for ObamaCare in the wake of yesterday’s 5-4 decision by the Supreme Court. 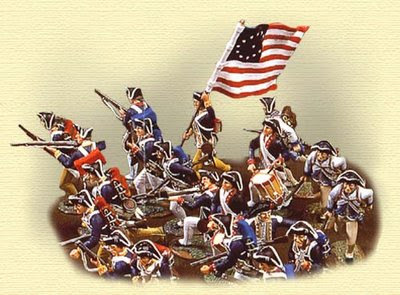 From 1763-1775, the rallying cry in the colonies was: No Taxation without Representation! In 2012, our rallying cry should now be: No Taxation by Misrepresentation! Not only did PPACA (Obamacare) pass Congress without any mention of the word “tax”, its defenders have emphatically denied that the law’s “mandates” represent taxation. Had the funding for the bill been presented as a tax increase, it would almost certainly have failed. Incredibly, Chief Justice Roberts accepted the Government’s argument that the “mandate” is after all just a tax (wink, wink), and consequently the Government has the Constitutional authorization it needs to fund PPACA through taxation. Thus the SCOTUS majority effectively rewrote the bill, “deeming” it to say something that it does not, and then declaring as Constitutional a bill that does not even exist! I would have never believed such a thing could happen in the Supreme Court. A Constitutional tax bill must originate in the House. The reason is that the Framers wanted tax increases to be launched only by those who would most immediately be facing re-election. But PPACA originated in the Senate. Strike 1. A Constitutional tax must be an income, excise, or direct tax, and there are rules that must be followed for each. Clearly the PPACA tax is neither an income nor an excise tax, so it must be a direct tax. But Constitutionally, a direct tax must be apportioned by population. The PPACA tax is not apportioned by population. Strike 2. Even without these explicit violations of the Constitution, by the rule of reason and good faith, Congress can vote for taxation only via legislation that explicitly calls that taxation by its proper name — a tax — in full view of the voters. Congress and PPACA did not do that. Strike 3. How could any Justice, let alone the Chief Justice, ignore all this? By voting as Roberts and the majority did, our own Supreme Court has aided and abetted a massive fraud on the American people. This should be the stuff of novels, not real life. Normally, one can seek redress for fraud through the courts. Where does one go when the highest court in the land aids, abets, and virtually commits the fraud? … to say that the Individual Mandate merely imposes a tax is not to interpret the statute but to rewrite it. Judicial tax-writing is particularly troubling. Right on. The entire law should have been rejected and offered back to Congress either for the trash bin or for editing and a re-vote by elected representatives in full view of We-the-People. Has Roberts no shame at all? Many Conservatives are so disappointed in Roberts that they are frantically concocting explanations and rationalizations for his astounding malfeasance. One wretched contrivance argues that Roberts’ real motive was, somehow, to protect the integrity, balance, and honor of SCOTUS itself. Really? How does aiding and abetting a gargantuan national fraud do that? Another rationalization argues that Roberts is cleverly giving Conservatives a “Remember-the-Alamo” loss that will so anger and energize Americans that they will throw Obama and his neo-Marxist, redistributionist entourage right out of Washington. But if SCOTUS is politically gaming its rulings to that extent, how can we count on SCOTUS in the future? If there is any government branch that should play it straight, surely it is SCOTUS. The bottom line is that SCOTUS has ruled PPACA to be Constitutional by deeming the bill to be something that it is not. The SCOTUS decision is an Orwellian absurdity and a stain on SCOTUS that will remain until long after we’re all gone. Memo to Chief Justice Roberts: Et tu Brute? With this betrayal and breach of the Framers’ final bulwark of protection for Constitutionally limited government, all we have have left is the ballot box. In November, we must win a new President and Congress, and we must exercise eternal diligence thereafter. The Left will never quit, and neither should we. Pass the word: No Taxation by Misrepresentation! Hillary Clinton: Shame on You Barack Obama! 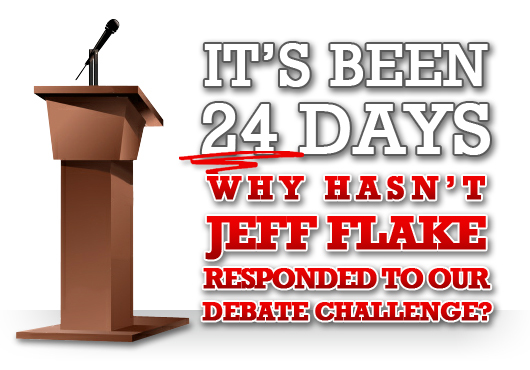 Phoenix, Arizona – 24 days ago, Wil Cardon’s campaign sent a letter to Congressman Flake challenging him to a head-to-head debate. In the past several months, there have been numerous candidates forums across the state. Wil has participated in many of them. Congressman Flake, however, has ducked many of them, sending a surrogate to read a letter instead. Now that the race has become so competitive, Wil wants a head-to-head debate with Congressman Flake. Unlike a candidates forum, this kind of debate allows for the two principal candidates to interact with each other – it’s an important difference that allows voters to contrast the candidates. Arizonans deserve to know all they can about the candidates to make the best decision in August. But, it seems Congressman Flake disagrees. Tempe, AZ – Today the Vernon Parker campaign announced it will launch its first television ad for the campaign. The spot will air locally on Cox cable and will begin airing on Monday, July 2nd. VP: Obamacare. It was a travesty. An abomination. A big government takeover of health care. We did not want it. We could not afford it. It should not have happened. Now the Supreme Court has spoken, Congress needs to clean up the mess. No more raids on Medicare. Let doctors, nurses and health care professionals make the medical decisions not big government. The way it should be. I’m Vernon Parker and I approved this message. Parker, 52, is a rising star in the Republican Party. He is current councilman and former mayor of Paradise Valley. Raised by his grandmother in a severely underprivileged neighborhood, Parker was able to escape his environment through love, education, and hard work. For more information about Parker or his campaign, visit www.vernonparker.com. TUCSON, AZ – The Supreme Court has provided an opportunity for the people of The United States to be included in the debate on the Affordable Health Care Act (ACA). Now that the Court has ruled the individual mandate, though unconstitutional under the Commerce Clause, can be upheld under the enumerated power of Congress to tax, it is time for Congress to perform as promised in 2010 for the complete repeal of ACA. With repeal, there will be an opportunity then for Americans to join the debate they were denied in 2009 on how to best reform our healthcare system which has been plagued by bureaucracy and fraud for decades. President Obama is on record with the claim that the ACA was not a tax, but his lawyers defended the act as a tax during arguments. This historic decision has increased the scope and reach of the power of the Federal government to tax and regulate behavior. Small businesses and the middle class will suffer financially under the biggest permanent tax increase in our nation’s history. If the ACA continues to be implemented, it will only expedite the destruction of free market principles and freedom of health care choices for all Americans. I am optimistic because the Court’s decision has by default given the decision back to Congress and We the People. We are blessed to live in a Constitutional Federal Republic and a government that is of the people, by the people and for the people. Through this next critical election, we can send a message to Washington by electing representatives to Congress who will bring the power back to the people and stop the encroachment of government. Washington, D.C.—Today, U.S. Congressman Paul Gosar, D.D.S (R-AZ) released the following statement regarding the full vote by the U.S. House of Representatives to hold U.S. Attorney General Eric Holder in contempt of Congress. This vote is the result of continuous delays by Holder and the Department of Justice to release subpoenaed documents from the reckless Operation Fast and Furious. As the only member from Arizona on the committee for Oversight and Government Reform, Congressman Gosar has been a leading advocate for the victims of this horrible operation by demanding answers and justice. Gosar is the lead sponsor of H. Res. 490, a Resolution of No Confidence in the Attorney General which currently has 114 cosponsors. “Five decades of inside-the-beltway healthcare planning have been unable to stop the runaway costs that continue to plague families and bankrupt the federal government. Today’s Supreme Court ruling further bureacratizes our healthcare system while foisting a huge tax increase on the American people, despite President Obama’s promises to the contrary. For more than 10 years, Leah Campos Schandlbauer served worldwide as an operations officer for the CIA’s National Clandestine Service. A lifelong conservative and strong believer in the principles of economic liberty and limited government, Leah decided to pursue a different type of public service when she chose to run for Congress in Arizona’s newly-created 9th District. Leah is a graduate of Arizona State University with a degree in political science. She also attended Rhodes Junior High School in Mesa and Chandler’s Seton Catholic High School, where she ran track and played basketball. Leah and her husband, Alfred, a Foreign Service officer with the U.S. Department of State, have four children. For more information, visit: www.leahforcongress.com.